'Sar pi bi, lah?' Meaning 'Have you eaten? ', is a common greeting throughout Myanmar. That just goes to show how seriously they take their food! But most travelers do not know what to expect when it comes to Myanmar cuisine. Read on to find out about the exotic flavors and culinary culture of the Golden Land. While Vietnamese food and Thai food seem to be known worldwide, few visitors know what to expect of the food in Myanmar. 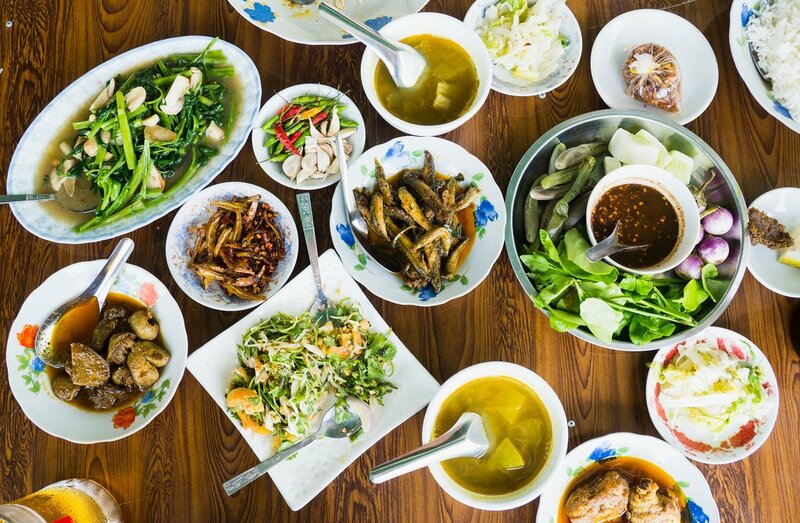 But once on the ground, you will find a cuisine unlike any other, with loads of regional variations as well as a blend of Thai, Indian and Chinese cooking styles. The food relies heavily on locally-grown produce, so seasonal variations are common, and there is always a delicate balance of texture as much as flavor in traditional dishes. Here we outline a typical day of eating, from the times to the places to the most popular items! Breakfast is normally eaten outside, at a tea shop or street stall. Myanmar is an ‘early to rise’ type of place so most shops open by 5:30 or 6:00 am. The most popular dish is mohinga, a noodle soup that is often referred to as Myanmar’s national dish. The broth consists of chickpea powder, catfish, lemongrass and herbs blended into a thick stew that is then poured over rice noodles. A variety of condiments, such as crispy fried beans, hardboiled egg, lemon, and coriander, can be added on top. There is also a wide range of noodle ‘salads’, with rice or egg noodles tossed with oil, garlic, shredded meat, onions and more. Indian-style breads like naan and fried palata are also popular and come served with boiled peas or meat curry. At lunch time, which falls right at midday, rice curry is the dish of choice. Myanmar curry is different from its regional neighbors, with the sauce consisting of a tomato base mixed with oil, garlic, and other spices. The curry is placed in a small bowl and served with up to a dozen other bowls which hold side dishes such as vegetable salads, fish paste, boiled vegetables, pickled vegetables and other items. A clear soup, used to wet the palate, is served on the side as well as a large plate of rice. The afternoon in Myanmar almost always features ‘tea time’, a break around 3:00 pm for a snack and a chance to chat. Street vendors gather outside office buildings and busy intersections to sell freshly fried samosa, savory Myanmar-style pancakes, tropical fruits and more. These snacks are washed down with a cup of tea or coffee- the perfect afternoon pick-me-up! As the sun sets, it’s time to think about dinner. Myanmar families tend to eat early and at home. Generally, the meal is similar to lunch (curry and rice) or may consist of some stir-fry dishes that are a blend of Myanmar and Chinese cuisines. In smaller communities, there are not many restaurants open at night so even singles tend to cook and eat at home. But in the cities, such as Yangon and Mandalay, there are many options and dinner time is a particularly social time. Curry shops are open but they tend not to be as fresh in the evening so a popular option is a local ‘beer station’. Found throughout the country, these open-air shops serve cold beer, a selection of barbecue items and some stir-fry dishes. The barbecue is cheap and tasty, with lots of meat varieties as well as ample vegetarian options. If you have a sweet tooth, fear not! Myanmar’s residents also love their sugary treats. Ice cream can be found just about everywhere and small cakes made of semolina, coconut and/or bananas are also ubiquitous.